Got My Helmet Today Via Fed-Ex. Took it out of the box and the bag. Put it on and went and rode. Very Comfortable. Size is right. Great airflow. Only thing is Shield is a little close to Nose and Mouth, But i just Raised The Shield up on Notch and It was Right. I have no regrets Buying this Helmet . Great Helmet For The Price. May have to Buy and Extra Due to Price and Quality. As a first time bike rider at age 71, I don't know how qualified I am to write a review. This helmet fits me very nicely and is very comfortable to wear. It has a considerable amount of interior padding. Overall form, fit and function of the helmet exceeded my expectation considering the price. Nice product. , Fit and finish of the helmet (not the visor) feels good. But the visor seems to be cheap quality, It cracked on the sides when I was doing high speeds within a week. So guess will have to purchase a replacement visor for a brand new helmet used for less than a week. Other than that helmet is value for money. Overall great purchase. Super fast shipping and quality product! I was looking for a cheaper 3/4 helmet since I wanted ear coverage for my Sena SMH10. The helmet seems to fit low on the brow but may change a bit during breaking in. Wind noise is not bad even at fairly high speeds. The visor is a bit irritating, all the way down is very close to my nose and mouth which fogs up easily. When the visor is up it is directly in my line of sight so I'm looking through the bottom edge so I pretty much have to ride with it a few notches from bottom and top. I have thought about trying to cut the visor down to fix my issue. It would be nice if they made the shield a bit short or at least a version you could buy that was shorter. Overall, a solid helmet with good airflow...just bad visor issues for me. I am quite impressed with this helmet for the price. It is not as good as my $150 HJC, but for about 1/3 the price, it is a great buy. Arrived the next day with regular shipping! Super comfortable fits great! Love the style and ease of face cover operation. This helmet runs small! I wear a 7 1/2 hat and I needed a 2XL to be comfortable. The XL squeezed my head too much even on a short ride. Other than that this is a great helmet for the price. I was really impressed by how light it is. Also very good visibility. I bought a pair of these for passengers, and honestly i was surprised at how comfortable they are. I don't get the sensation that they would last as long as a more expensive helmet, but if i needed a helmet quick and didn't have a lot of money, i would get one of these in a minute. As far as a passenger helmet goes, it's easy to get on, and it doesn't have any protuberances to hit you in the back. Love it! Thinking about buying a second! This helmet is awesome I bought it for my fiance and she loved it... So I tried it out one day and fell in love as well. Very comfortable and air flow was great! I like 3/4 helmets and the candy red is my color. I needed a new helmet. My last helmet was for a street bike. I need something that gives me more air flow for summer months. I love that I can raise the visor. The color matches my husband's bike. Price was right, and free shipping closed the deal. Like the color choices, and the flip up clear lens. Great value for a "guest" helmet. is this helment dot certified? Thanks for the response and I will try to remove the front panel. Is this Snell 2015 approved? Does this helmet secure with d rings or a clasp? BEST ANSWER: D-rings. 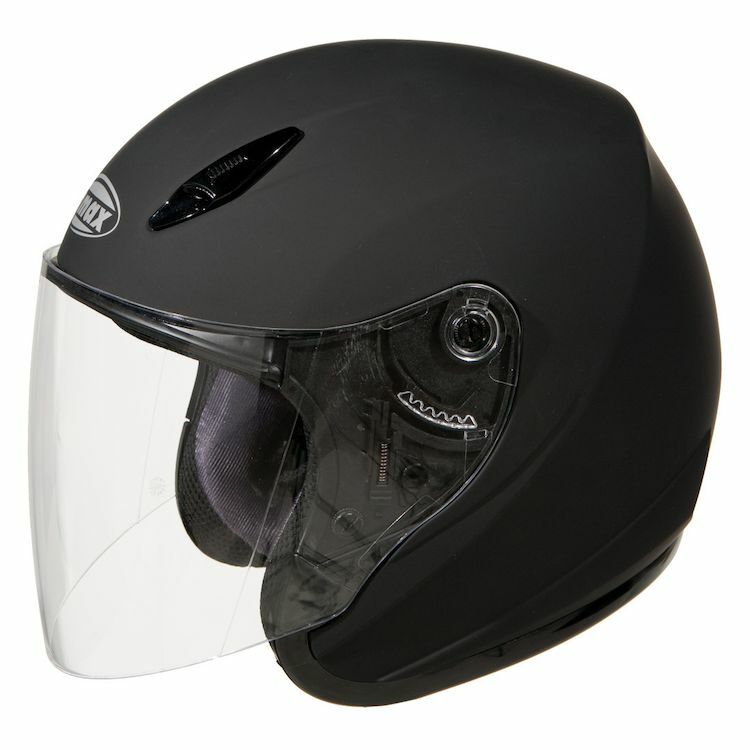 Very good quality helmet at a great price. Does it come with tinted shield?